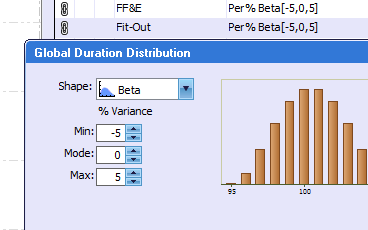 A Monte Carlo-based risk-analysis tool for simulating CPM and GPM schedules. Developed in collaboration with industry-leading risk-management professionals, NetRisk offers a unique feature-set unmatched by alternative products. Completely redesigned and rewritten, NetRisk 2.0 offers specialized functionality in a single application, resulting in an advanced feature-set at a competitive price. In NetRisk, a risk's probability of occurrence can be un-correlated amongst the activities to which it has been assigned - and in fact, it can even be different. This approach is more realistic for risks that affect activities that are scheduled years apart or at different project sites. 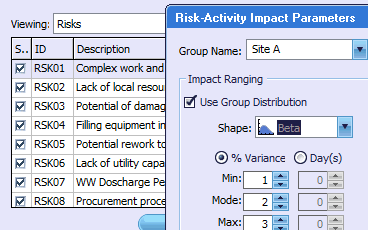 Thanks to automated risk sensitivity analysis, NetRisk re-runs the entire simulation, each time removing the risk with the biggest impact. 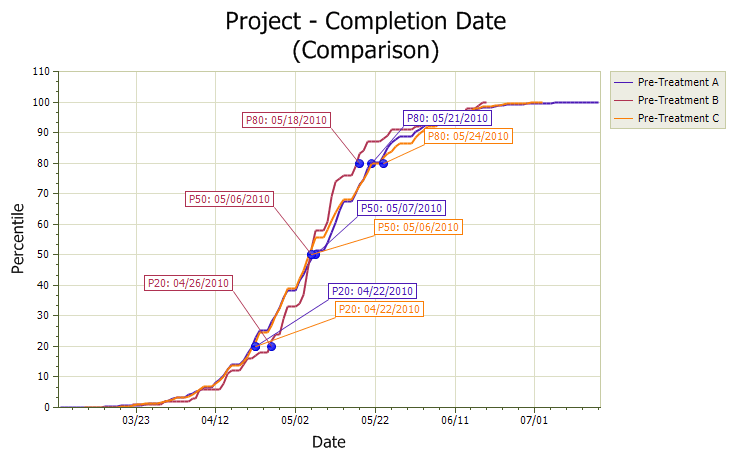 The result is a tornado chart showing the exact impact in days that each risk has on the project completion. 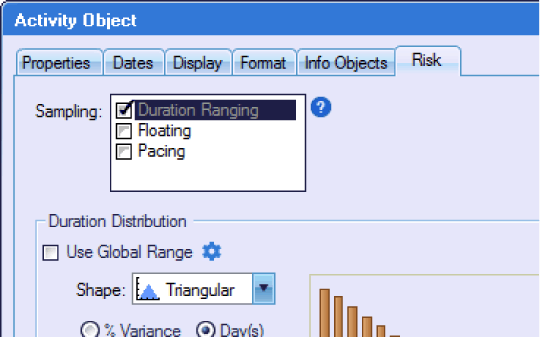 By scheduling activities on early starts in every iteration, CPM risk analysis does not account for the impact of float use on project completion and therefore overestimates the probability of completion. With NetRisk, activities off the critical path can be started later to model resource leveling, progress pacing, or other strategic reasons, resulting in a more realistic model. Define qualitative probabilities and impacts, prioritize by risk ratings, enter mitigation strategies, and record responses and comments, all in a single view directly within NetRisk. Overlay calendars on top of activities for modeling probabilistic weather, hurricanes, shutdowns, or other non-working windows, and view their impacts together with risk sensitivity results. Tabular interfaces for rapid data entry combined with the elimination of obstructive dialog boxes result in an interface that is both easier to learn and quicker to operate than alternative products, without sacrificing capability. 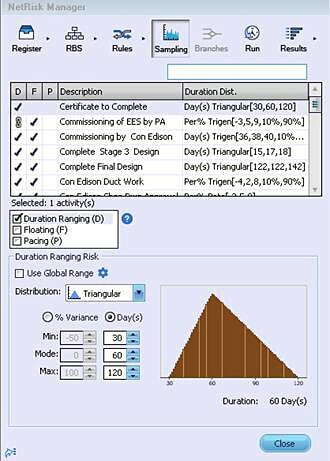 Correlate activity durations and risk likelihoods and impacts, choose from over half a dozen probability distributions, and run simulations using Monte Carlo or Latin Hypercube sampling methods. Use the mouse to remove, resize, or rearrange individual columns or entire panes, resulting in a personalized view that works for you. 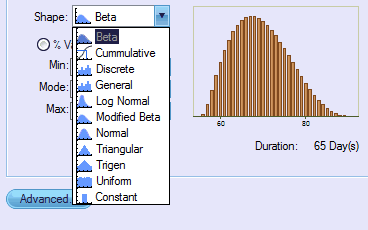 View frequency distributions, criticality indices, cruciality, sensitivity, and more. Compare results across activities or across simulations at the click of a button. Rename titles and axes, resize text, configure colors, and add markers for confidence intervals, percentiles, and variances. Ask about options for converting a subscription to a perpetual license!